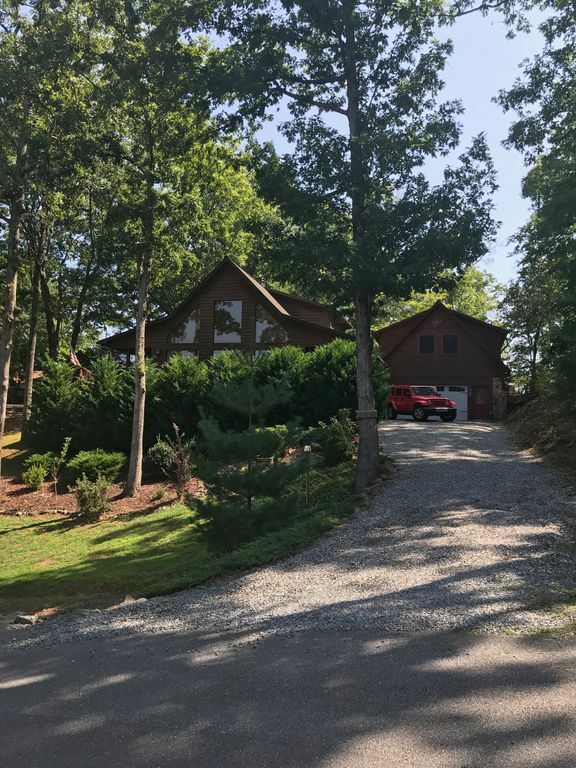 No cleaning or service fees This tranquil romantic spacious 3 room apartment is situated in a beautiful mountain cabin setting on blacktop roads. Located 4 miles from the John C. Campbell Folk School, 1/4 of a mile from the Hiwassee River with a private pavilion and river access, spend the day tubing and fishing ,3 miles to Murphy where you can enjoy shops and restaurants, centrally located to many other historic towns and attractions and 7 miles to Harrah's casino.Within 5 min to 45 min you can enjoy an array of hiking and biking trails, white water rafting, with skill levels for everyone,many lakes and Trout river fisheries,River kayaking, many area waterfalls. Horseback riding, several local wineries and breweries with tours and tasting rooms.The private 3 room apartment is situated over the detached garage and has a designated parking space and a private entrance and is accessible by stairs the unit is equipped with cabin furnishings and consists of a living area with a futon and 2 loveseats a kitchenette with a stocked fridge, pub table and chairs. Unit is stocked with snacks and other various goodies, Continental breakfast foods and supplies, microwave, Toaster,sink, dish washing supplies,keurig coffee maker, pub table and chairs a business area with desk and a reading area and a romantic gas log fireplace, flat screen TV with sound system. Bedroom is furnished with a king size log bed,dresser, flat screen TV, private bath has a jetted tub/shower and a walk-in closet.Continental breakfast items are included in the rate and full use of all outdoor areas 3 decks for viewing the beautiful sunrises and sunsets and the local wildlife that frequent the yard ,a patio area with flowered pergola, grills and outdoor patio fireplace (firewood included) or enjoy our new outdoor fire pit area. Full bathroom with jetted tub/shower combination. bath towels as well as Beach towels for use at the river. Living room has a futon, 2 love seats, flat screen TV over the fireplace. Accommodations were fantastic & location very convenient to both Folk School & downtown Murphy. Even better than advertised. No problems whatsoever. All creature comforts furnished. Great stay !! It was very good and no complaints. I was attending a jewelry workshop at J. C. Campbell Folk School and the location was very convenient. I guess getting old makes driving sometimes difficult at night and I had difficulty negotiating the driveway late at night. Unfortunately, I did not get to visit with Doug since I left early for the workshop and returned late. He surely takes care of your needs and the stay was wonderful. This property is immaculate, beautiful, comfortable, and all around 5 stars! This is my families’ favorite property we have stayed in to date because not only is it so beautiful and comfortable, but the host was just so welcoming and accommodating. We feel lucky to have stayed here and plan to return! We highly recommend this gorgeous property!! Lovely area, beautiful apartment and yummy snacks! Mark was an outstanding host and provided amenities that are not usually included by most hosts - from the Ralph Lauren towels to the wide choice of snacks, food and drinks. Thank you so much for the kind comments about your stay at our Mountain Retreat. It is our desire that every guest has an enjoyable relaxing memorable experience. Please note that the apartment is above the garage so there is a flight of stairs that you must climb to get into the apartment.